This graphic depicts the relative shapes and distances from Mars for five active orbiter missions plus the planet's two natural satellites. With two more Mars orbiters sent into space last year, traffic has picked up around the Red Planet — so much so that NASA recently bolstered its monitoring process to avoid future traffic jams. NASA's Mars Atmosphere and Volatile Evolution (MAVEN) spacecraft and India's Mangalyaan probe both began circling the Red Planet last September, bringing the total number of operational Mars orbiters to five — the most ever. NASA's Mars Odyssey and Mars Reconnaissance Orbiter (MRO) and the European Space Agency's Mars Express are the other three spacecraft. "Previously, collision avoidance was coordinated between the Odyssey and MRO navigation teams," Robert Shotwell, Mars Program chief engineer at NASA's Jet Propulsion Laboratory (JPL) in Pasadena, California, said in a statement. "There was less of a possibility of an issue," Shotwell added. "MAVEN's highly elliptical orbit, crossing the altitudes of other orbits, changes the probability that someone will need to do a collision-avoidance maneuver. We track all the orbiters much more closely now. There's still a low probability of needing a maneuver, but it's something we need to manage." This tracking is accomplished with the aid of NASA's Deep Space Network of radio dishes, which is managed at JPL. If two spacecraft look like they’ll come uncomfortably close to each other, JPL's Mission Design and Navigation Section will alert the orbiters' handlers so they can decide whether or not to change one of the paths. 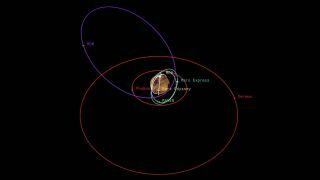 Such an alert went out on Jan. 3 of this year, when automated monitoring determined that MRO and MAVEN could come within about 2 miles (3.2 kilometers) of each other two weeks later. In that case, "before the timeline got short enough to need to plan an avoidance maneuver, the uncertainties shrank, and that ruled out the chance of the two spacecraft coming too near each other," Joseph Guinn, manager of JPL's Mission Design and Navigation Section, said in the same statement. NASA’s updated collision-avoidance process also tracks the location of the space agency's Mars Global Surveyor, a spacecraft that arrived at the Red Planet in 1997 and ceased operations in late 2006. Follow Kasandra Brabaw on Twitter @KassieBrabaw. Follow us @Spacedotcom, Facebook or Google+. Originally published on Space.com.